MEXIQUE – Cantil de las animas - Mexican archaeologists have discovered in the western state of Nayarit a series of petroglyphs estimated to have been carved between 850 and 1350 A.D., the National Anthropology and History Institute, or INAH, said. The bas relief carvings have a symbolic character and are attributed to ancient groups from the Aztatlan cultural complex, and they were found at a site called "Cantil de las animas" (Cliff of the souls), in the mountainous portion of Nayarit's southern high plateau, an area where archaeological finds have been practically unknown. The carvings appear along a horizontal band almost 4 meters long by 2 meters wide, arranged on volcanic rocks that form a cliff approximately 10 meters high, the INAH said in a statement. The iconography of the petroglyphs is linked to the pictorial tradition of the Aztatlan culture, which from about 850-900 through 1350 A.D. inhabited mainly the low coastal lands in northern Nayarit and southern Sinaloa state, INAH archaeologist Mauricio Garduno said. 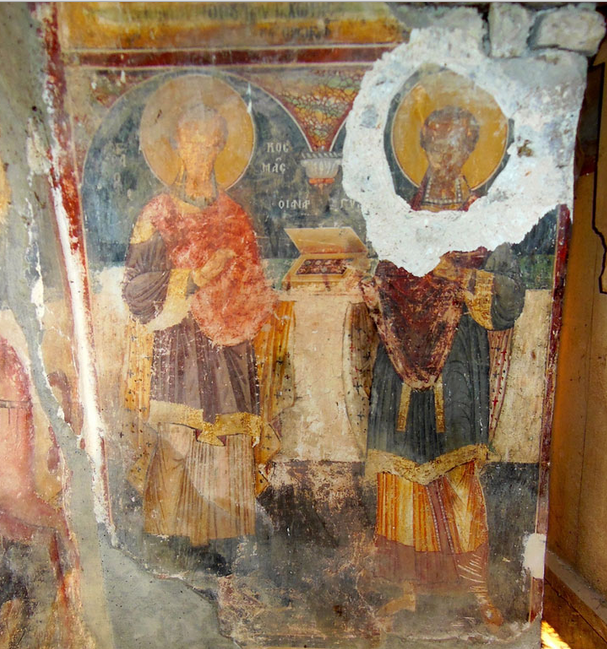 ALBANIE – Valsh - Important medieval frescoes of St. Premte Chapel in the remote village of Valsh in central Albania, have suffered irreparable damage at the hands of thieves who tried to prize them from the walls.The frescoes mainly depict religious scenes, some of which were created by Onufri, a 16th century icon painter who spent a period of his life in Valsh. Widely considered to be Albania’s greatest icon painter, Onufri is renowned for his colours and style and introduced greater realism and individuality into facial expressions, breaking with the strict conventions of Byzantine art. His works were signed with the title “Protopapas” (Greek: Πρωτόπαππας), demonstrating a senior position in the church hierarchy. The thieves mainly concentrated on removing the heads of the saints, some of which they managed to hack from the walls, while other unsuccessful attempts left parts of the frescoes crumbling on the floor. USA – Mesa Grande - A new archaeological park has been built for a 6-acre site that represents the remains of one of the largest and most complex ancient Hohokam platform mound communities. The Mesa Grande Ruins cultural center, which had its groundbreaking in September and its grand opening Saturday, explores what archaeologists believe was the religious and cultural center of a large Hohokam settlement that was abandoned in the 1400s. The Hohokam people were skilled potters and farmers who developed a sophisticated irrigation system for their crops. They built and used the temple mound site -- once covering about 600 acres overlooking the Salt River -- between approximately 1100 and 1450, when the community perished, according to the Mesa Grande Ruins Community Alliance. FRANCE – Paris - The “Victory of Samothrace” one of the most iconic works of the Louvre, which since 1884 is prominently displayed at the top of the monumental Daru staircase, will be restored as from September, the French museum announced on Monday. The Louvre advisory committee responsible for restoration matters has given the green light for the project which includes the cleaning of the marble statue and the renovation of the staircase. An international team of experts will follow the works which will take more than a year to be completed. Cost is estimated to be 3 million euros. The project will be funded by Nippon Television Holdings, Fimalac and Bank of America Merrill Lynch Art Conservation Programme. One of the three most popular exhibits of the Louvre (along with Venus de Milo and the MonaLisa), the Victory of Samothrace is a Greek Hellenistic era statue, dated to 220-185 BC. It was discovered in 1863 broken into countless pieces, on the Aegean island of Samothrace. It represents Nike, the goddess Victory. After careful restoration work at the Louvre, the main block (legs and lower torso) was put on display in 1866. Overall, the work measures 5,57 m in height. The statue stands 2,75 m tall including the wings. By this restoration, the Louvre intends to solve some structural problems which were not addressed in the previous restoration of 1934, as Jean-Luc Martinez, director of the Department of Greek, Roman and Etruscan Antiquities said. “The modern concrete base is slightly cracked, but there is no danger” he added. Above all, they are going to clean the statue, which has become very dirty over the years. “We are going to rediscover the contrast between the white Parian marble of the statue and the grey Rhodian marble of the boat and base” Mr. Martinez explained.